Last night we paid our first visit to Vigilucci’s Trattoria Italiana in Leucadia. I can state with confidence it won’t be our last visit. GM Andrea Balzarini greeted us warmly upon our arrival and seated us promptly. Our server Alexis, who’s been part of the staff for eight years was quick to check on us and get us water while we took a gander at the menu for San Diego Restaurant Week which begins this Sunday January 21. 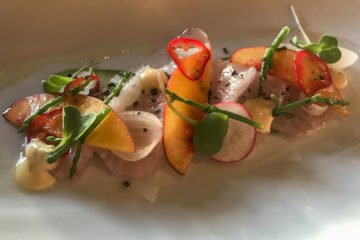 For $30, you get a full three-course dinner with your choice of three antipasti dishes, four secondi (entrées) and two desserts. This is truly a bargain and a wonderful opportunity for you to become acquainted with Vigilucci’s. A server brought us a basket of warm, soft, freshly house-baked bread with a dish of olive oil and Balsamic vinegar. We both had a hard time not eating every bite. When Alexis came back, we placed our orders. 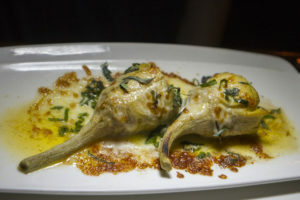 I opted for Calamari Luciana, baby calamari sautéed with garlic and white wine in a spicy tomato sauce, while Kat chose Carciofini al Forno, oven-roasted artichokes filled with Parmigiano, parsley, black olives, more garlic and mozzarella. 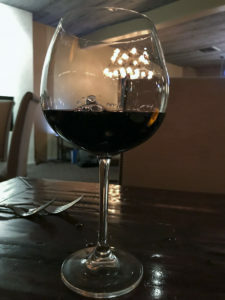 We sipped on a Conn Creek Napa Valley red blend and listened while a pianist played tunes from James Taylor, Elton John, Jackson Browne and more. Our antipasti was served and it was almost too pretty to eat. Almost. My calamari was piping hot and packed with flavor, with the perfect amount of garlic. The artichoke was stunning and so very tasty. Both of us practically licked our plates clean. We visited with Alexis and learned her sister encouraged her to apply for a job there. Her sister has been on Vigilucci’s staff for ten years. She says they both agree it’s an excellent place to work. The secondi was presented to us. 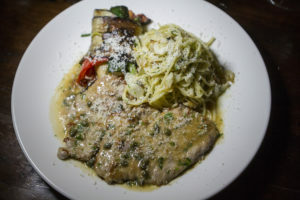 I opted for Piccata di Vitello al Limone (pan-seared milk-fed veal with capers in a lemon sauce) while Kat went with Ravioli di Ricotta e Spinaci (house-made ricotta and spinach-filled ravioli). The veal was thinly sliced and cooked to perfection, served with a side of spaghetti with garlic and olive with red chili flakes. The vegetables were grilled green beans, carrots and bell peppers wrapped in thin slices of zucchini and then baked. Kat’s ravioli was served with Alexis’ recommendation of a vodka sauce which was divine. All the pasta at Vigilucci’s is house-made. We shared Tiramisu and Cannoli for dessert. The presentation was elegant. 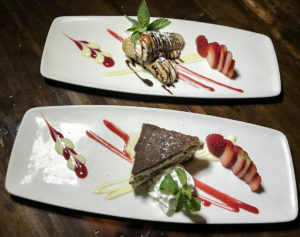 The Tiramisu was light and delicious and served with fresh whipped cream. The Cannoli had a crunchy crust and a lovely filling. Both were served with fresh strawberries. I enjoyed limoncello while Kat sipped cappuccino. We visited with Andrea, who gave us tour of the restaurant. Just off the main dining room is a smaller room with a wood-burning oven where their pizzas are cooked. He pointed out to us that both the pizzas and pastas can be made gluten-free. We strolled down a half-level to the outdoor patio, ideal for warmer weather. There are also several themed rooms, including Venice, Florence and Naples that can accommodate groups of various sizes. 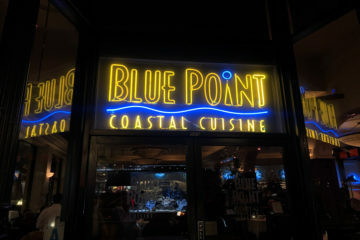 They offer live music every night, with three musicians rotating nights. 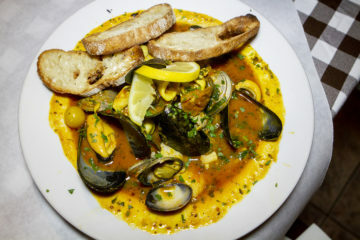 Whatever your choices may be for San Diego Restaurant Week, I highly recommend a visit to Vigilucci’s Trattoria Italiana. 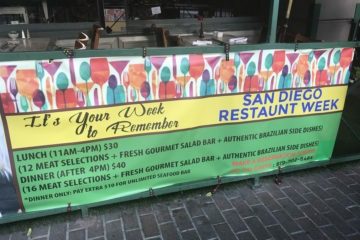 They have a total of three San Diego area restaurants, all participants in Restaurant Week. They also have a market offering Italian specialties as well as their amazing pastas. 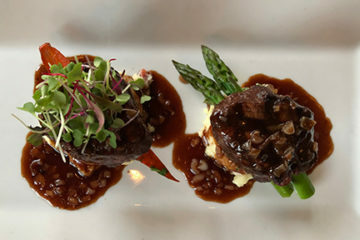 In business for twenty years now, Vigilucci’s Trattoria Italiana is located at 530 N. Coast Highway 101. Here’s a link to the dinner menu they’re offering. Hi Tom! First time visitor to your site! 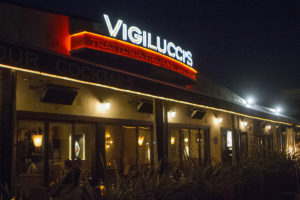 Vigilucci’s looks like a wonderful place for dinner, especially that housemade ravioli! 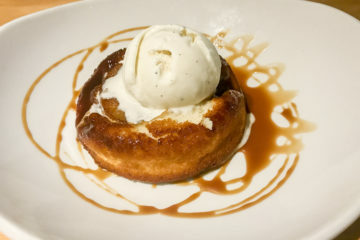 We previewed SDRW dinner at SoleLuna Cafe this week and I noticed you enjoyed your own visit there last year! Italian is the way to go right? 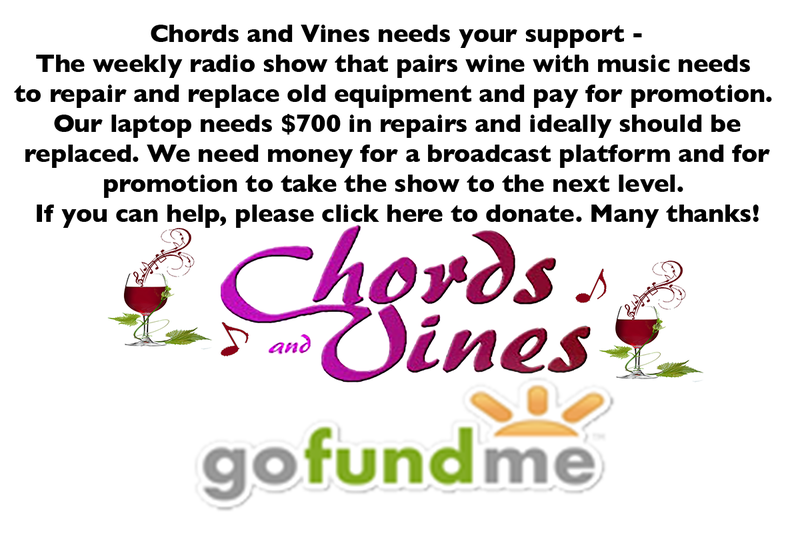 Hope you stop by to check us out as well! Hi Lynn. Thanks for stopping by. Glad you found us!Your site is terrific. Let’s stay in touch.